Atos, a global leader in digital transformation with approximately 100,000 employees in 73 countries, provides an in-depth big data training program for its Dutch and Belgian employees. After a rigorous selection process, they chose to partner with GoDataDriven to develop and deliver some of the courses. 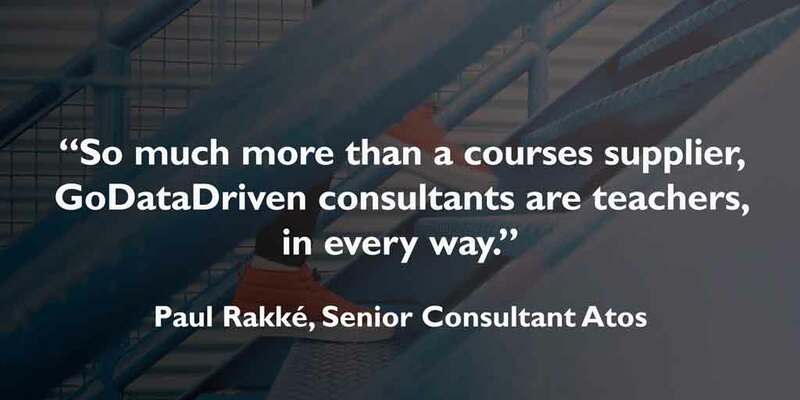 Paul Rakké, a senior consultant at Atos who is also responsible for training and development, said, “The GoDataDriven trainers are also consultants who work directly on projects with their clients. Since we believe in combining theoretical knowledge and practical experience, we see a great fit with GoDataDriven." For the consultants at GoDataDriven, teaching is always part of the job. Working onsite with clients often involves working with people who don’t know as much about data science and data engineering. Since the consultants often have to explain a lot, their teaching skills come in handy. It also works both ways. Because of their abilities and consultancy experience, the GoDataDriven trainers can also teach others how to build robust and scalable data science solutions and bring them into production. Responding to market demand, Atos had already been working in big data and analytics for several years but wanted to develop its in-house competencies. “The technology evolves rapidly, and well-educated, experienced data scientists are scarce,” Rakké explained. “We wanted to accelerate our capabilities in the data field, so we chose to be trained by the most experienced practitioners we could find; the people from GoDataDriven. They are so much more than a courses supplier, they are teachers, in every way,” Paul Rakké, Senior Consultant at Atos. The entire training program consists of approximately 60 modules and includes some general subjects, such as working agile or Scrum, and design thinking. For the more technical modules, Atos teamed up with GoDataDriven to develop courses for Hadoop, Machine Learning, Python, R, Text Analytics & Search, and Spark. 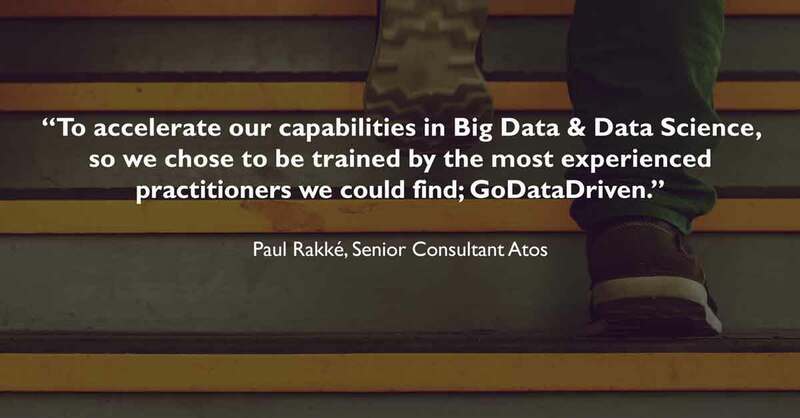 “Flexibility, agility and the ability to tailor programs to the maturity of the group are key for Atos, and so again, another reason why we found a great fit with GoDataDriven,” said Rakké. As part of this project, GoDataDriven was also tasked with developing exams. Atos wanted the course participants to receive a certificate that stood for more than attendance or completion. "The exams are not easy, but that’s a good thing," smiled Rakké. "We want the certificates to have value since they could be the deciding criteria for potential clients," he said. Interested in Data Engineering & Data Science Training Capabilities? For in-company training, feel free to get in touch! Whether you want to learn how to implement Hadoop, Spark or Neo4j, our public Data Engineering Training provides the practical knowledge you need to tackle real-world big data challenges! You can learn how to process data and drive the value of information for your business with Xebia Academy’s cutting-edge Data Science Training.